Philip Agbese: Who is Afraid of the AGF's Investigation? 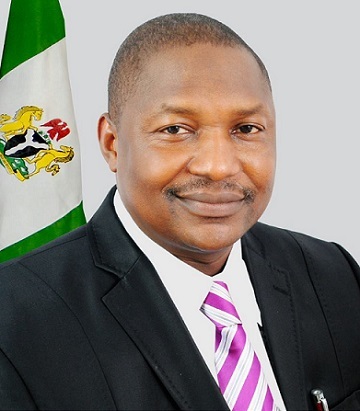 President Muhammadu Buhari's directive to the Minister of Justice and Attorney General of the Federation (AGF), Abubakar Malami (SAN) to investigate the involvement of any top government officials accused of any wrong-doing for prosecution if found liable is at risk of going the way of past probe that yielded little or no results. No. It is not because the ad-hoc panel is compromised; it is because the kind of people that published such past efforts are hard at work engaging their old tricks that may just again prove effective. Mr President's directive was not unconnected with the black eye he suffered when the Senate first indicted and called for the removal of the Secretary to the Federal Government (SGF) Mr David Babachir over conflict of interest and inflation of contracts and later within the same period refused to confirm Ibrahim Magu as the substantive Economic and Financial Crimes Commission (EFCC) chairman citing a security report that fingered him for corruption. As many indigenous proverbs would say, when a tree falls on each other it is the topmost one that is first evacuated. This would imply that the AGF's assignment must first consider the immediate incidents that prompted President Buhari's directive, in this case the veracity of the Senate's indictment of Babachir and Magu before working back to unresolved allegations that pre-date those two. Note the operative word, unresolved. It is consequently worrisome that some people are openly attempting to derail the AGF's investigation while parading as if they are making nationalistic contributions to its work. At the forefront of these detractors is the Civil Society Network Against Corruption (CSNAC) which issue a statement to leak the content of a letter it supposedly wrote to the AGF listing a plethora of cases for which it had written petitions in the past. In the statement CSNAC issued it explained its action as helping Mr Malami to carry out the assignment given by Mr President. It however failed to address the obvious contradictions and conflict of interest that this unsolicited assistance presents. First, CSNAC has a dodgy tie to one of the duo that triggered the investigation. It had in the past issued statements in favour of Magu when accusations of corruption first surfaced against him. Like the letter the group recently wrote to the AGF those statements in favour of Magu were couched to appear altruistic and aligned with national interest while their true intentions would only be deciphered upon closer examination. In some instance, the communication may not even mention the acting EFCC boss by name but would set out to savage his perceived enemies notwithstanding. There is no evidence that the list of several past petitions that the group is redirecting the AGF's Office to are not a compendium of literature generated for Magu. Secondly, providing information "to help the office of Mr. Malami" and then rushing to the media with a statement smacks of blackmail; it is an equivalent of owning up to attempting to teleguide the investigation into arriving at a predetermined outcome, boxing the AGF's office into a cul de sac from where it can only do the bidding of the vocal minority that have equally hijacked the public opinion space. If the intervention were sincere as painted it would have adopted the Biblical approach of not allowing the right hand know what the left hand has offered – this for instance would have made it less likely for anyone named in those documents to pressure the investigating team. But by issuing that statement CSNAC has opened a floodgate of pressure on the team from those is supposedly wanted investigated. One can only hope this group is not the vice that is being used to turn the screw on people as it happened with a certain retired Air Commodore in Maitama during the probe of arms sales scandal. Furthermore, CSNAC knows what it is doing. Far from widening the circle of the searchlight or helping the investigating team to focus its beam, this CSO is all about overloading the investigation with work in the hope of rendering it ineffective in view of the ties it has with one of those being investigated. How else does one explain the fact that some of the supposed cases it was drawing attention to have been disposed off in the past without the people named in them being indicted. Without the benefit of new or additional information what is the logic of dredging up such frivolous petitions if not to distract the AGF's office? With the benefit of what we know from the past, CSNAC is but a poster child for the other groups that will surface to try similar trick before the investigation is concluded. With more of such groups coming up it is a matter of time before the AGF's Office is overwhelmed with offer of information that would eventually jeopardize its work. Once this happen, what Nigerians had hoped was the biggest opportunity to deal corruption a mortal blow would be lost. Abubakar Malami (SAN) thus stands in that intervening space in history to discard chaff in favour of the kernel by carrying out Mr President's directive without contaminants that will ridicule us all. Malami must ensure that no persons or groups distract his investigation by clogging its workspace with petitions and allegations that had been disposed of in the past having been found wanting for lack of substance. Those that are afraid of the outcome of an unbiased investigation are no doubt behind these antics. But who is afraid of the investigation?